Step aboard the S/V Mandalay at 5 PM, Sunday, July 14th, in St. George’s, Grenada and get ready to depart on a 7-day, 6-night sail through the Grenadines. We will visit a selection of islands which may include Grenada, Carriacou, Union Island, Mayreau, Tobago Cays, Bequia and possibly other stops along the way. 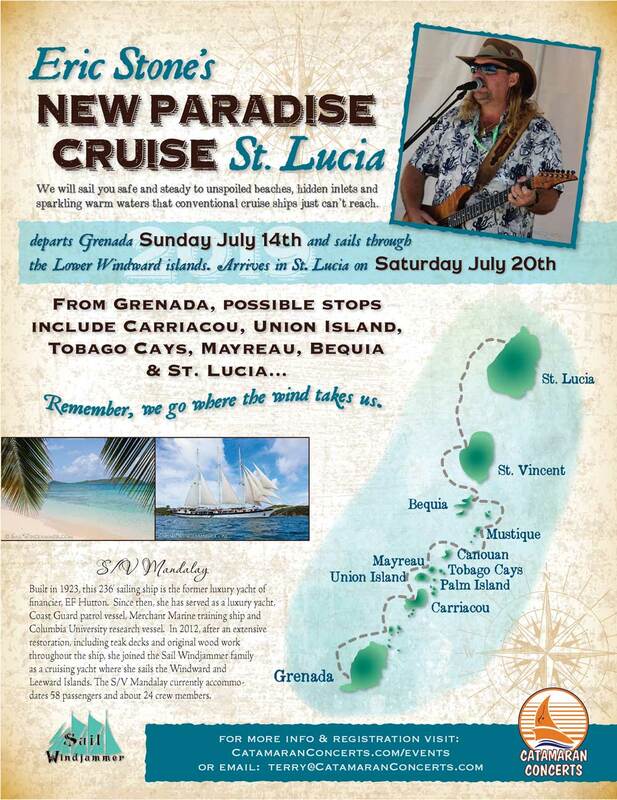 We disembark at 10 AM, Sunday, July 20th in Castries, St. Lucia. Purchase Tickets for St. Lucia Now! American, Delta, Jet Blue, United, British Airways, Air Canada, Virgin Galactic Air France West Jet Caribbean Airlines and Air Antilles Express all have daily flight from St. Lucia. We will be offering great rates on hotels in St. Lucia for those that want to stay a day or two after the cruise to enjoy the many historical sites and popular tours of the island. Our Bon Voyage Party will be held on Saturday, July 13th at Umbrella’s Beach Bar on Grand Anse Beach, just a short walk from our hotels. Plan to arrive about 6 PM, order dinner and drinks and about 7 PM, entertainment will be provided by Eric Stone. Later on in the night, Eric will join some local musicians and the fun will continue. Details on the Post Cruise Party in St. Lucia are still being worked out, so stay tuned for more information. About June 1st, after we know when everyone is arriving in Grenada & departing St. Lucia, we will be able to offer discounts on many of the popular tours available on the islands. I encourage everyone to arrive at least a day or two early and/or stay a day or two later so you can enjoy the local culture and history. If you fly into Grenada the day of our departure on the Mandalay, Sunday, July 14th, you will have plenty of time to travel from the airport to the ship, if you allow us to arrange your ground transportation. You may even have time for a leisurely drink and walk around the neighborhood to visit the local shops prior to boarding the Mandalay. If you fly into Grenada one or more days prior to our departure on the Mandalay, you will have time to check into your local hotel, get to know the local neighborhood and on Saturday, July 13th, attend the Bon Voyage Party on the beach with the rest of use. On the day of our departure, Sunday, July 14th, we can arrange a half day or full day tour of the island or other popular destination. Just check out of your hotel, throw your luggage in the van and at the end of the tour, you will be delivered directly to the ship by 5 PM. On our arrival in St. Lucia on Saturday, July 20th, we can arrange a half day or full day tour of the island or other popular destination and then deliver you to the airport in time for you to catch your flight home. If you plan on staying in St. Lucia for an extra day or two, we can arrange for ground transportation to take you from the ship to your hotel. You will have plenty of time to catch a half day tour and attend the Post Cruise party on the beach. The following day, we can arrange a half day or full day tour of the island or other popular destination and then deliver you to the airport in time for you to catch your flight home.